After you waited patiently… and then waited some more… for news on the next WWE DVD/Blu-ray in the works, WrestlingDVDNetwork.com has a “Giant” exclusive to share with you today! 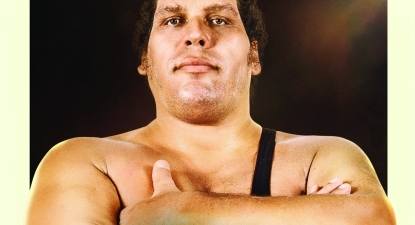 Joining the line-up on the 2019 WWE Home Video schedule known so far will be a DVD simply titled “Andre The Giant” (tagline: “Even bigger than you imagined”); the second Andre DVD released by the company to date following the 2005 offering of the same name. HBO Sports and WWE will once again become a tag team to bring us a physical copy of the 1-hour and 25-minute HBO documentary feature from last year and we can confirm that the documentary will be accompanied by some new extras selected by WWE. Mark your calendars for a worldwide release beginning May 2019. Additional details and pre-order opportunities are on the way! TEASER TIME: The new Andre The Giant DVD is another Home Video concept that first appeared on a fan survey issued by WWE back in June 2018. “Best of NXT TakeOver 2018” was another one found there in advance of being made official. And WrestlingDVDNetwork.com can now reveal that as of right now there’s one more on that list that will soon be confirmed for 2019. The ambitious, wide-ranging film explores Andre’s upbringing in France, his celebrated WWE career and his forays into the entertainment world. It includes interviews with Vince McMahon, Hulk Hogan, Ric Flair, Arnold Schwarzenegger, Billy Crystal, Rob Reiner, family members and more. Seems like lots of changes are happening in the wrestling media world and I personally am not ready for these changes that are coming. I realize whether I like it or not, change is inevitable, but doing one and two disc releases is a huge letdown. I am in a position where I am watching home media slowly die and it’s very sad. I was a kid of the 1990s and will always prefer physical copies of things rather than streaming devices and Networks. That’s just me. I am too. You can’t collect footage from a Network that may be taken down any day at the owner’s discretion. Plus, I like not having to have a WiFi connection to watch my sh*t.
wwedvd.co.uk already have the content for it ready..unfortunately only 1 disc, and just DVD edition. I hope the documentary alone will be worth it, because the extras could have been better for sure. maybe the expression BETTER is not fit regarding the extras..more so, the extras could have been plenty more in numbers, hence it should have been a 2-discs bluray. Too bad it’s not a 3 disc set, and no blu-ray. But I expected no blu-ray. Not sure if I’ll get it. I want it, but living in the EU, we will soon have to pay custom fees on goods bought in the UK. Not a fan of this whole brexit thing, lol. I think this is the first documentary release since Kevin Owens. (minus WWE 24 – 2018) Even though this was an HBO thing, I hope this is the first step in going back to releasing more docs and other DVDs. It’s been pretty underwhelming ever since WB started taking part in their production. I stand corrected – the UK is getting the matches, but it’s only a handful. This release is still “easy fruit” for WWE to pick. Still no evidence that there are going to be any truly interesting 3 DVD sets in 2019. I’m wondering how many discs it will consist of. It’ll be interesting to find out. This would be a good place to get creative with the match listing. Especially I’d like to see Andre’s early career more. The 2005 release was pretty disappointing. One of the greatest superstars in wrestling history and they only devote 90 minutes to him. The matches were pretty disappointing. Hopefully with this new release, they will give us never before released matches. They’ve got to be sitting on a lot of footage from the 70s and 80s. The 2005 Andre DVD was just a re-release of on an old Coliseum Video from 1985. It wasn’t new. This upcoming Andre release is the first new Andre set in almost 35 years. Not counting the 1999 A&E biography video. I rather enjoyed for what it was. About time we got some news! This is long overdue. I wonder if they will include some TV taping dark matches with this set? This was a really good documentary. Glad it’s getting a home video release. With HBO involved, I would think a blu-ray will be guaranteed, but with WWE lately you never know.